More and more of us feel stuck in our careers because we are living out of alignment with ourselves. You might have taken a job at a company you thought was a good fit for your values, but slowly over time you realized you don’t share the same values. Now you feel trapped between making a living and living with yourself. When you are feeling lost, hopeless or overwhelmed, I’m a big believer in getting back to basics by reconnecting what you value. Your most limited personal resource is your attention. It’s more limited than your money, time, energy, knowledge, skills and connections. The great struggle of life is how to maintain our attention on what we value most. Values help you do that. When you are faced with a big life-changing decision, it’s your values that center you to make the best decision for you and no one else. Every day we make endless, seemingly tiny decisions we think don’t really affect our course in life, but they do. It’s your values that remind you of the significance of those tiny decisions to prevent your life from slowly going off course. Values empower you to define failure and success for yourself. Your values give you the courage to be yourself. They help you align yourself with like-minded people who want to see you succeed because they respective your values. When you understand and live your values, you stand for something. You gain clarity about what you want and don’t want. People will be drawn to you. They describe how you give your attention and remind you of how you want to pay attention. 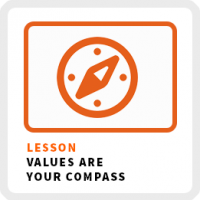 Values aren’t something you search for online and pick out five words from a list of 400 words someone else identified as values. Why? Because those are someone else’s words, not yours. Don’t choose values to please others! Discover your values by observing your actions, habits and behaviors. 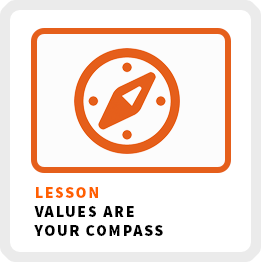 Your values are your personal code of conduct. They are like a mantra helping remind you on a regularly basis of how you want to think and act. They are intentions of how you want to live everyday, not aspirations of what you wish to be. #1 Make a list of your proudest moments. #2 Track your strongest reactions. #3 Make a list of people you respect and admire. Make a list of people you know and even people you don’t know that motivate you to be a better person. What values do you think they hold? Which of those values are most important to you? If writing is not your thing, try visualizing your values by gathering images that energize you. Look for patterns and trends among the images you’ve gathered. How would you describe the values they represent and share? When you do these exercises, you can use any words, phrases, sentences or sayings you want to represent your values. What’s important is they are your words and you feel connected to them. Remember, your values are a statement of how you want to live your life and work. The next time you have a tough decision, first check in with your values to see if they are in alignment with your choices.